Jersey City is the second most heavily populated city in the state of New Jersey (after Newark), with an urban population of around 250,000 residents. It is also the second most densely populated city in New Jersey, and covers a total area of approximately 21 square miles. Jersey City is one of the eastern United States’ most significant commercial port cities and is also an important transportation hub. The climate of New Jersey is classified as a ‘humid subtropical climate zone’, which sees the city experience hot, humid summers, and cool winters. 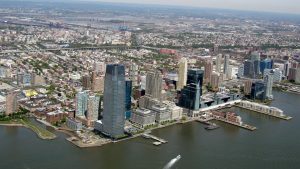 The climate is fairly typical of the north eastern United States and Jersey City is typically spared from most extreme weather events as a result. This also means that climate does not significantly influence the local pest population behaviour. Common pest problems in the Jersey City area include bedbugs, rodents, and ants. Rodents can be a troublesome pest problem for both urban and suburban city dwellers alike. They are experts at squeezing through very small cracks to enter your home and once inside, can multiply quickly to become an infestation nightmare. Rats and mice spread diseases easily and can be a health risk to humans. Additionally, they often chew through cables and wires, causing damage and exposing a home to the risk of electrical faults and house fires. The chance of a rodent infestation can be minimized in a couple of ways. The first is to ensure that all sources of food that rodents may be attracted to are cleaned away and stored securely. Secondly, gaps through which rodents may enter a domicile should be covered or sealed. Vents should be protected with cloth or wire mesh, while any gaps larger than a quarter of an inch should be addressed (including gaps under doors). While an embedded rat or mice infestation can be dealt with by using bait or traps, the cleanest and most efficient results are generally achieved by using a licensed exterminator. Bedbugs are another common pest problem in Jersey City and can make life particularly uncomfortable for residents. These creepy crawlies feed on the blood of human hosts while they sleep. A common query when it comes to pest control regulations is with whom the responsibility falls for addressing bed bug infestation issues: the landlord or the tenant? In the state of New Jersey, this argument was resolutely settled with the New Jersey Legislature ‘Assembly Bill A-3203’ which clearly defined this responsibility as belonging to the property owner. The law, which was passed in 2009, states that landlords must take steps to eradicate the infestation as soon as they are made aware of the problem. Additionally, owners must distribute state-produced pamphlets to tenants that make them aware of the signs of bed bug infestation and the existence of this law. Non-compliance can result in fines of up to $300 for each infested bedroom and $1,000 for infested common areas. There are a number of reputable pest control agencies in the Jersey City area including Jersey City Pest Control and ChemTec Pest Control.